UBK Markets is regulated by the Cyprus Securities and Exchange Commission (CySEC) and has a license No. 186/12 that allows the Company to provide financial services internationally. The Company is permitted to provide investment and ancillary services or to perform the investment activities related to the financial instruments stated in the attached Annex. 1. I, II and III means Part I, II and III of the Third Annex of the Law 144(I)/2007, respectively. 2. The numbers in the brackets correspond to the Paragraph of each Part, as defined in Paragraph 1 of these explanations. CySEC is a supervisory authority responsible for the regulation of financial markets and supervision of the Cyprus Stock Exchange as well as of the companies providing investment services and ensures their strict compliance with the financial regulations in accordance with the EU laws governing their operation. CySEC is a member of the European Securities and Markets Authority (ESMA) and is regulated by the European Union Directive MiFID, 2004.
to issue licenses to investment companies. UBK Markets strictly and with high responsibility complies with all the rules and regulations of financial activity. The Company provides reliable protection to its Customers to ensure secure and professional trading environment. The CySEC license allows the Company to become a direct member of European exchanges and easily establish offices in the EU member states. Registration. UBK Markets Ltd was established in the southern part of the European Union (Limassol, Cyprus) in 2011. Registered address: KYRIAKIDES BUSINESS CENTER, 2nd floor, Leoforos Spyrou Kyprianou, 67, 4003, Limassol, Cyprus. CySEC imposes tough requirements on financial companies. Therefore, UBK Markets meets the strict requirements related to business operation, regular accounting as well as audit reports. All this guarantees our Customers stability and reliability when working with UBK Markets. MiFID. UBK Markets operates in compliance with European, international and local laws, including the Markets in Financial Instruments Directive 2004/39/ЕС of the European Parliament (MiFID), which came into force on November 1, 2007. This Directive guarantees transparent and effective financial market infrastructure in the countries of the European Economic Area (EEA) and protects the interests of its participants and consumers’ rights. 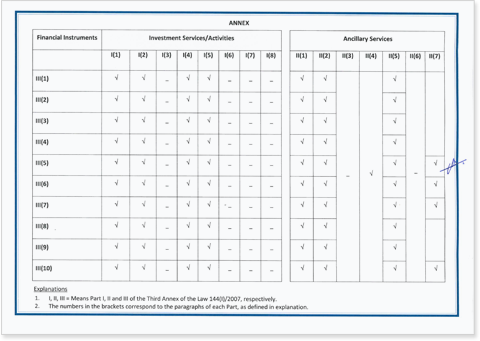 MiFID was adopted in Cyprus through the Cyprus Investment Services and Investment Activities and Regulated Markets Law of 2007 (Law No. 144(I)/2007). 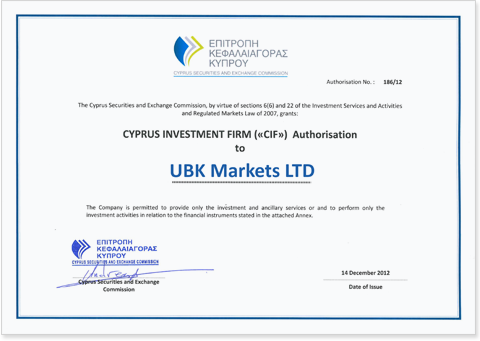 UBK Markets is a member of the Investor Compensation Fund (ICF) for the customers of Cyprus Investment Firms (CIF) in accordance with the Law No. 144(I)/2007 of the Republic of Cyprus.